Can you imagine your job without the seemingly never ending stream of new buzz words, terms and abbreviations? 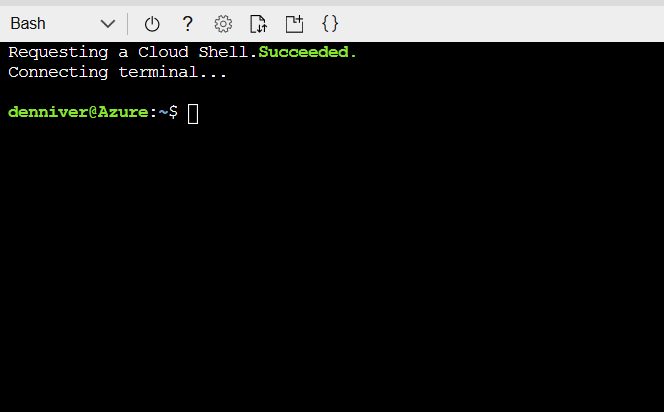 Regarding Azure command line administration and automation there are a few important terms, which can be easily confused and therefore can make things seem more complicated than they really are or simply mess up conversations. Hopefully that clears things up a little. If your are getting started with Azure automation, check out the Azure Automation Snippet Pack. The reason I created CM in the first place, was to have an quick and easy way to recycle code. I hate doing things twice and I am annoyingly forgetful when it comes to certain things. So I needed a quick way to find code again that I had already written, but didn’t bother to turn into a easy-to-find snippet. And CodeManager does that already quite well I think. But, there is always room for improvement, so there is a new advanced search dialog, support for boolean expressions (yeah! :) ), quick folder sorting and a way to quickly set up shop on another machine, share snippets… and so on. Sounds good? Build complex search queries, just with a few clicks or keystrokes. Quickly create single file backups of all your snippets and scripts. Easily share your snippets with a colleague or install them on a new machine. You can now quickly sort (name or last change date) every folder, node or sub node via its context menu. As well as about 40 bugfixes and countless little handling improvements. You can download the installer (or Zip) on CodeManagers home base: here. I’ve created a set of 20 Azure snippets (in the form of reusable functions) to get you started with Azure PowerShell automation. 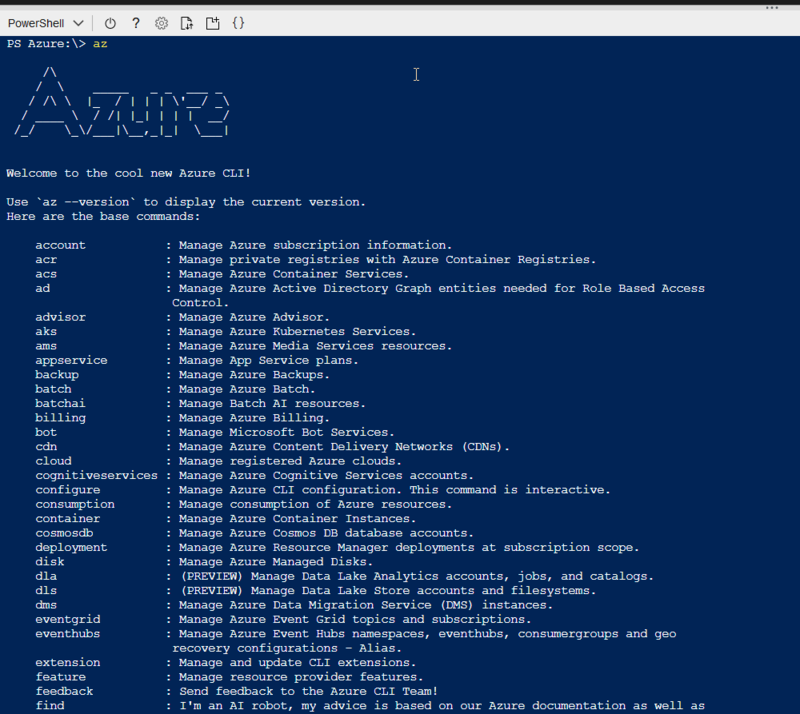 There are snippets for authentication, installation, virtual machines, storage and SQL and all of them use the new Azure PowerShell AZ module which is the replacement for the AzureRM module. The CMB-file can be installed quickly in CodeManager v7 via Snippet Backup->Restore. It contains ISE-snippets, so you can use them directly in ISE, but they can be used with CodeManager with any editor (like VSCode) of course. So improvement and speed is the general focus this time, so apart from a few visible nice features, there are a lot of small changes and handling improvements, which you will notice when you use certain functions. You can now filter as many functions as you like, either by selecting them in the all-functions overview or directly in the graph. This gives you the ability to quickly and easily create the graph you want. You can now apply quick-filters for all or selected search results, and save these as a preset as well. As well as about 60 bugfixes and countless little handling improvements. Unfortunately due to provider trouble the auto-updater in v5 does not work anymore, so please download the installer (or Zip) manually on CodeManagers home base: here. 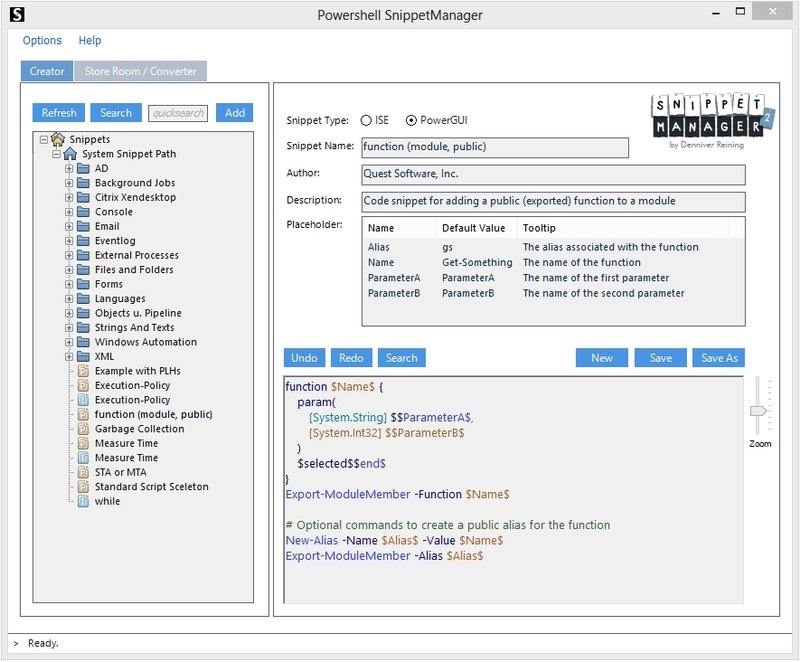 I’m happy to announce the release of PowerShell CodeManager 5.0! CodeManager? Yes, I changed the name again. :) But not (just) for fun. As the added support for scripts in the last version might have indicated, this tool is becoming more and more about PowerShell code in general, not just in the form of snippets. 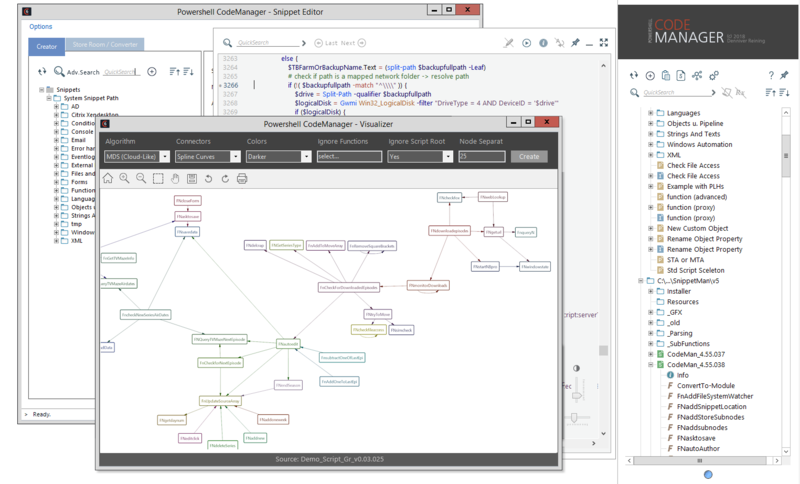 The new Visualizer creates interactive function dependency graphs. That means it displays all the functions of a script and connects them, to depict how they interact with each other and from where they are being called. Interactive Map –Each element of the graph can be clicked to show the code of the selected function and the position from where a function is being called. Documentation – Document the logical structure of your script. Graphs can be printed and saved either as a PNG image or in vector format to allow further editing in any vector capable graphics tool. Zoom in – Graphs can be created for complete scripts, as well as single functions and their relations. Customize – You can choose between different layout algorithms, connector-types and color schemes. Nodes and connectors can be manually rearranged. Partial Reindexing – Helpful for larger script and snippet libraries: in most cases, necessary re-indexing is now limited to the folder the change occurred in. Info Window – Quick info to file -path, -size, -attributes, -hash, -description and code statistics. Either turn on the update-check in Snippet Manager 4 or download the installer (or Zip) manually on CodeManagers home base: here. Hi, some people have been reporting an issue with the “Add Location”-buttons when using Snippet Manager on Windows 10. This update takes care of the problem and fixes a few minor issues with the installer as well. You can get the update as always via the internal update function or download the msi or zip here. Hi everybody, i’d like to announce the release of Snippet Manager & Injector v4! This time it’s all about speed and comfort. There are some very nice new features, but my focus was: improvement. The Injector now indexes and searches your script (ps1) files! Snippets are great. But, as fast and easy they are created with Snippet Manager, you still need to create them. And you will, very soon, but today you need a function that does … and you know you already did something exactly like this a while ago. Mhm… but what was the name of that script again…? You can now quickly find a certain script and re-use some of its code. Just type the name or some of the code you are looking for in the search box… done! Manager and Injector now support regular expressions in all search fields. – … and lots of other improvements like: Large Quick-hide Buttons, Expand and Collapse Buttons, a hide-emtpy-folders option etc. Location indexing and Search speed have been massively improved. On a fast local drive, Injector can search code in thousands of scripts and display its results in under 2 seconds! You can open scripts via double click from Injector in any editor capable of handling powershell scripts. That way Injector can even serve as an easy access, de luxe “open file” dialog for your script editor, complete with search function! You can now simply set in the options menu, what you want to see when you start Snippet Manager: the Manager window, the Injector window or just the floating launcher button. Either turn on the update-check in Snippet Manager 3 or download the installer (or Zip) manually on SnippetManagers home base: here. That’s it, I hope you enjoy the new Snippet Manager and Injector and as always: please don’t hesitate to contact me. After months of night shifts, I am very pleased (and a little bit proud) to announce the launch of Snippet Manager & Injector v3! 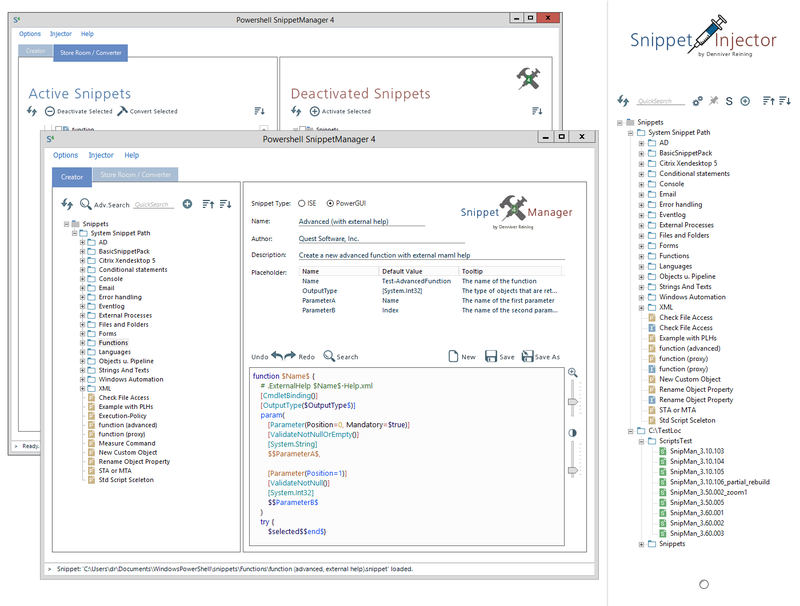 With about 8000 lines of Powershell code, it’s (literally) the biggest update for SnippetManager yet. :) It has really exciting new features and countless improvements and fixes. And did i mention it is of course still completely free? In short, if you are using snippets, you will love this. So in other words, if you have more than a couple of snippets or maybe want your snippets on a network share, you are screwed. This is where the Injector comes in. The Injector is a pop-up window, that appears on the side of the screen, lets you search and select a snippet and with the next click (or hotkey press) inserts the snippet into your editor. Any editor. The Injector has many nice features like Tooltips with syntax coloring, supports different ways of Snippet injection and can be customized in various ways. Find more videos on Snippet Managers homebase. If you need a pre-coded solution for a task or problem in your script, you can now simply search on PoshCode.org from inside SnippetManager. It’s fully integrated, so you search as you would for local snippets. The results appear in the SnippetExplorer with their description and can be used by a click. This is just the start of the integration of web-sources and -storage (nope, i did not say cloud, no no…. :)). There is much more to come. It always sounds a bit unimportant, but it is not: Syntax coloring lets you read and comprehend code faster. And if you have found your optimal colors, it’s a distraction if any of your coding tools uses different ones. So now aside from the two shipped coloring schemes (ISE color scheme, SnippetManager color scheme) you can create your own scheme. Fine tune the existing schemes or create a completely new one. Either way, odd colors won’t distract you anymore. # Notification Icon – quickly launch Injector or Manager. Can be used together with or instead of the floating launcher. # All settings, window positions and slider positions are stored and restored via the settings file now. Snippet Manager 3 does not come via auto-update at the moment, because I have a little bit of trouble with the free msi-creator I used for v2. This might take me a few more days. Fixed the installer issue. Thanks to the guys at Caphyon! So either turn on the update-check in Snippet Manager 2 or download the installer manually on SnippetManagers home base: here. On that page is also a Basic Snippet Pack ready for download now, to get you started if you have no snippets yet. That’s it, I hope you enjoy the new Snippet Manager and Injector as much as I do. Snippet Manager V3 will be released very soon. Tomorrow! 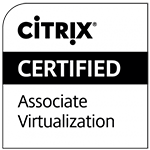 So turn on SnippetManagers auto update-check, so that you will be notified when V3 launches. You can easily convert all (or just a few of) your snippets from PowerGUI to ISE (and back) with just a click. Simply go to the Converter tab, select all the snippets you like to convert (ISE, PowerGUI or both; single files or complete folders) and hit the conversion button. Done! With the new quicksearch-box you can now even faster find the snippets you are looking for. 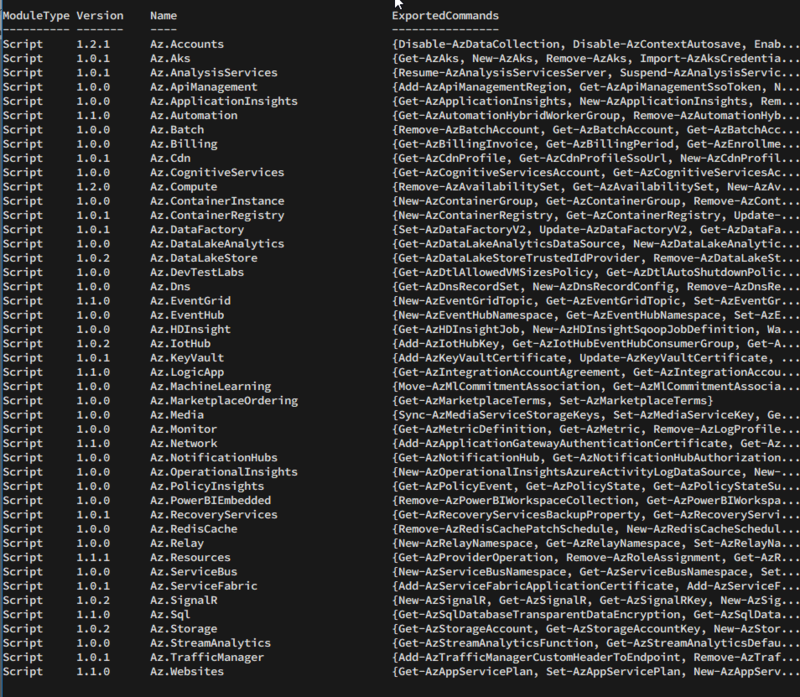 Just open SnippetManager and start typing a name, keyword, command… etc. Included are currently two coloring shemes (easily changable via the options menu): An ISE color sheme, which looks exactly like the colors in ISE and a (more moderatly colored :)) SnippetManager color sheme. # if you update SnippetManager from inside SnippetManager v.1.x, nothing really changes (except for all the cool features of course), you will still be able to start it from inside PowerGUI. You also get the desktop shortcut. # if you download and install SnippetManager by yourself, it should be started via one of it’s shortcuts on the desktop and start menu. I will however release “launcher”-add-ons for both PowerGUI and ISE later this year, so that you can use it even more conveniently. I haven’t decided yet, if i will bother everybody with it via the update function :), so if you are interested, better subscribe to this blog or check SnippetManagers home from time to time. You can update SnippetManager via the update function (just turn on the “Check for Updates”-option) or download it on it’s home page: here. That’s it, I hope you enjoy the new SnippetManager as much as I do.